Nicole Haroutunian is the author of the new short story collection Speed Dreaming. 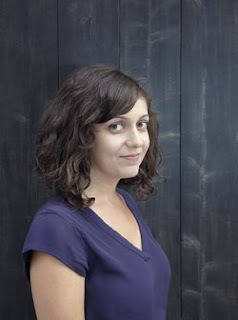 She is the coeditor of the journal Underwater New York, and she works as a museum educator. She lives in Woodside, Queens. 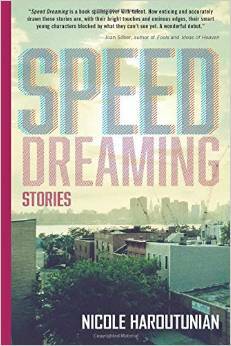 Q: How did you come up with the title "Speed Dreaming" for one of your stories and for the collection overall, and what does it signify to you? A: I wrote the title story last, because my editor thought that the linked stories "Pilgrims" and "The Last Unicorn" needed a third story to feel complete. In order to come up with an arc for the story, I tried to combine three disparate elements: a coyote at a child's birthday party, a death on the subway, and the sleepover game "speed dreaming." Once the game was in the story, the title seemed evocative. My editor is the one who suggested it as the title for the whole collection--it can have so many meanings. Q: As you mentioned, several of the stories are linked, and there seem to be some slight connections among the characters in other stories too. Did you write all the stories with certain themes and links in mind, or did the collection evolve in a more unplanned way? A: Besides those three stories I just mentioned, the collection did not start off as linked. But, during the editing process, my editor encouraged me to make the world of the book smaller. The teenage protagonist of one story became the younger version of Meg, from those three linked stories. Stories set in or featuring Pittsburgh, Poughkeepsie and an unnamed upstate location all moved to Poughkeepsie. A band mentioned in one story became the same band mentioned in another. A teaching artist in one story became the same teaching artist in another story; even though she's the protagonist of both, I think people miss that link because one story is in the first person and one is in the third. So, for the most part I wrote the stories with only the logic of that particular story in mind, but eventually, I tried to unite them so they all existed in the same space. Q: Many of your stories take place in or somewhat near New York. How important is the setting in your writing? A: It's very important in that I mostly write from observation rather than imagination. In general, I need to know a place in order to write it, so that limits where I can set my stories. New York City, Poughkeepsie, suburban New Jersey, a park in the Catskills and rural Wales--I've lived in or been to all of those places, hence the settings for the stories in Speed Dreaming. Q: Which authors have influenced you? A: I look to Lorrie Moore and Jo Ann Beard for dialogue and tone, to Laurie Colwin for character and to remember to be particular and strange, to Alice Munro for everything. I also love Jennifer Egan, Junot Diaz, Justin Torres... the list goes on! A: I am working on what I am thinking of as a novella. I love writing about teenage girls and their mothers, I think because I am right in between them in age (taking my family as an example)--I can identify, in some ways, with both, and in some ways with neither. A: I'm about to head out to read on the West Coast--your readers should come, if they're in the area!